How do you back up your SQL Servers today? You could be using backup software that require you to manage backup servers, agents, and storage, or you could be writing elaborate custom scripts which need you to manage the backups on each server individually. With the modernization of IT infrastructure and the world rapidly moving to the cloud, do you want to continue using the legacy backup methods that are tedious, infrastructure-heavy, and difficult to scale? 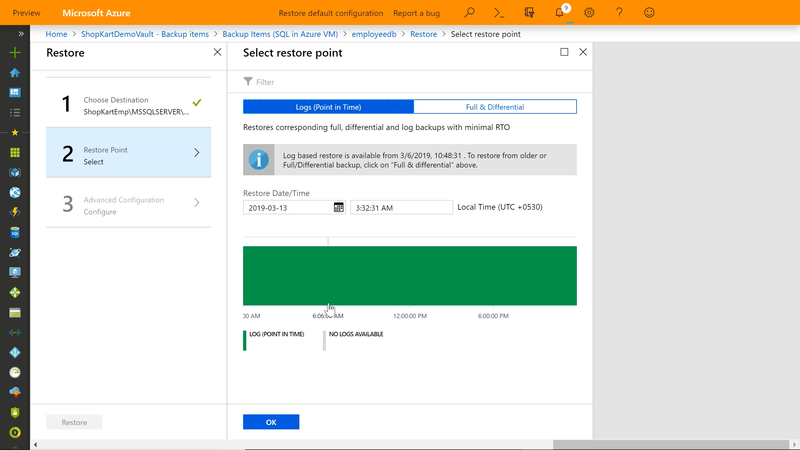 Azure Backup for SQL Server Virtual Machines (VMs) is the modern way of doing backup in cloud, and we are excited to announce that it is now generally available! It is an enterprise scale, zero-infrastructure solution that eliminates the need to deploy and manage backup infrastructure while providing a simple and consistent experience to centrally manage and monitor the backups on standalone SQL instances and Always On Availability Groups. 15-minute Recovery Point Objective (RPO): Working with uber critical data and have a low RPO? Schedule a log backup to happen every 15 minutes. One-click, point-in-time restores: Tired of elaborate manual restore procedures? Restore databases to a point in time up to a second in one click, without having to manually apply a chain of logs over differential and full backups. Long-term retention: Rigorous compliance and audit needs? Retain your backups for years, based on the retention duration, beyond which the recovery points will be pruned automatically by the built-in lifecycle management capability. Protection for encrypted databases: Concerned about security of your data and backups? Back-up SQL encrypted databases and secure backups with built-in encryption at rest while controlling backup and restore operations with Role-Based Access Control. Auto-protection: Dealing with a dynamic environment where new databases get added frequently? Auto-protect your server to automatically detect and protect the newly added databases. Central management and monitoring: Losing too much time managing and monitoring backups for each server in isolation? Scale smartly by creating centrally managed backup policies that can be applied across databases. Monitor jobs and get alerts and emails across servers and even vaults from a single pane of glass. Cost effective: No infrastructure and no overhead of managing the scale, seems like value for the money already? Enjoy reduced total cost of ownership and flexible pay-as-you-go option. 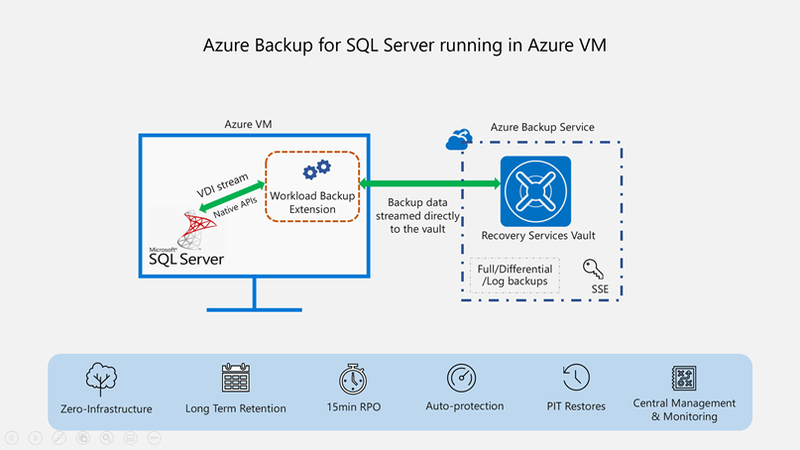 Click on the image below to watch the video, "How to back up SQL Server running in Azure VMs with Azure Backup." “We have been using Azure Backup for SQL Server for the past few months and have found it simple to use and easy to set up. The backup and restore operations are performant and reliable as well as easy to monitor. We plan to continue using it in the future." Check out the general availability announcement on SQL Server blog, "Enterprise-scale Backup for SQL Server Databases." See different SQL backup options from Microsoft and choose the right solution based on your requirements. Get the pricing details for this feature. New to Azure Backup, sign up for an Azure trial subscription.